Peter Gago is South Australia's Great Wine Capitals Global Ambassador and the man behind the nation's most iconic wine, Penfolds Grange. 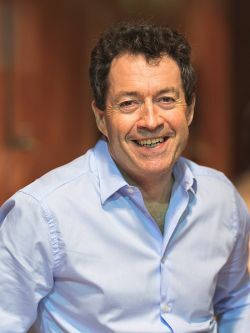 He has been Penfolds' chief winemaker since 2002, and in 2012 was named Winemakers' Winemaker of the Year by the international Institute of Masters of Wine. In June 2017, Peter was recognised in the Queen's Birthday Honours list, appointed as a Companion of The Order of Australia. In 2016 he was named a recipient of the Bragg Membership of the Royal Institution of Australia and in 2015 was named a Baron of the Barossa. Given Grange's global reputation, Peter spends a good part of the non-vintage time each year outside Australia, talking about his wines and where they are made. "When I pour a 10, 20, 50-year old South Australian wine offshore an automatic connection of time, place and quality is asserted," he said. "Any Penfolds red wine poured anywhere on the planet has been sourced, created and bottled in South Australia: often from many of the world's oldest vines, always from some of the world's oldest soils. Phylloxera-free. South Australian premium wines - crafted from clean soils, clean water and clean air." Peter believes membership of the Great Wine Capitals Global Network has elevated the state's wine profile on the international stage. "We're now benchmarking against world's most well-renowned wine regions and this gives us the opportunity to learn from their experience and insights."